A whole-of-community, multi-method program to improve mental health literacy in order to reduce the incidences and effects of depression, anxiety, deliberate self-harm and suicide among young people. The SPOTA program was developed by Ties For Lives, a not for profit health promotion charity. A nation that can spot the early signs of young people’s mental health issues and implement effective community responses and programs that improve and save young people’s lives. The SPOTA program achieves it’s purpose by implementing a collective impact community strategy that uses a multimethod approach to improve mental health literacy. This includes public awareness, community education and gatekeeper /action plans, as described in further detail below. Mental health literacy has been defined as “knowledge and beliefs about mental disorders which aid their recognition, management or prevention.” Mental health literacy includes the ability to recognize specific disorders; knowing how to seek mental health information; knowledge of risk factors and causes, of self-treatments, and of professional help available; and attitudes that promote recognition and appropriate help-seeking. Public Awareness complements existing public health programs and strengthens the research based mental health messages. SPOTA information cards and activities support the universal social marketing campaign that targets the improvement in behaviours around mental health recognition, knowledge and attitudes. Community Education utilises the existing evidenced based and evaluated programs developed by Mental Health First Aid Australia with a focus on delivering youth and teen training into schools and sporting clubs. Gatekeeper / Action Plans supports the existing health services and provides a framework and other essential information to create an outcome focused optimal care and prevention pathways to help bridge the gap in service availability. 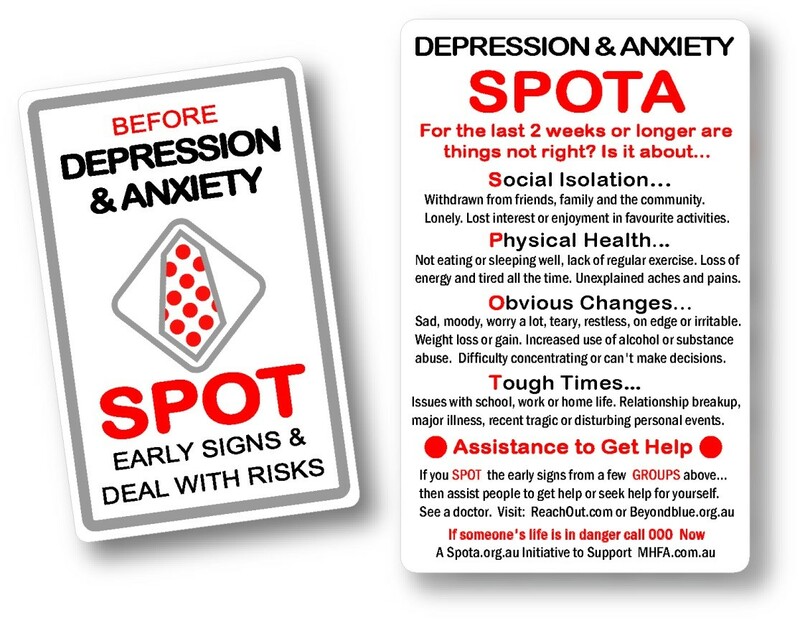 The SPOTA program uses a simple information card (SPOTA card) to convey their universal public message : SPOT the early signs… Get help, Be Helped, Give Help. These cards are distributed into participating communities through public presentations, retail displays and fundraising events. The SPOTA program’s SPOTaTHON forms a part of the public awareness campaign and fundraising with local sporting clubs, other organizations and businesses wearing the SPOTA charity arm band or other SPOTA trademarked merchandise and distributing SPOTA cards in to local communities. The SPOTA stylized logo device is a registered trademark and offers licensing opportunities with manufacturers and companies that distribute consumable products and other services to the public.